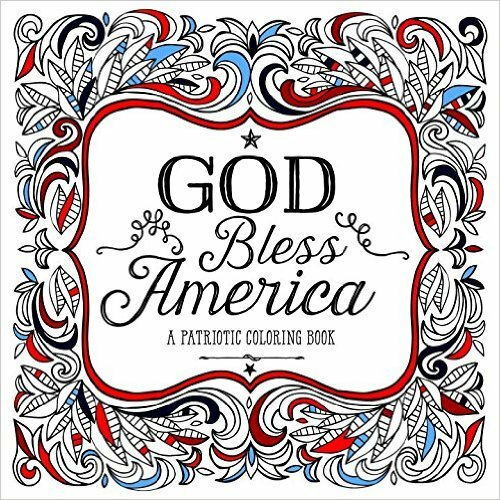 Attached to this review will be a silent flip-through of the entire coloring book so you can make an informed decision as to whether or not it will work for you. I will also include sample photos of a few of the pages in the book. 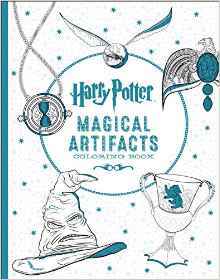 Rather than discuss how this is like or different from the books and/or movie series, I will discuss only how I feel about it as an adult coloring book. There are, once again, color image pages at the back of the book in case you wish to stay true to the original colors. As with the first three books in this series, there is a team of illustrators involved with the designs in this book. It seems like the list is much larger this time and perhaps that is why there is even a less cohesive feel to this book than in the prior three. It is easy to see the differences in design styles and the feel is much more cartoon-like than in the previous books. That may be due, in large part, to the subject matter. Dealing with the artifacts may lend itself to less realistic style drawing but I think that some of the images might have been improved upon but on the whole, I may fairly pleased with the book. There are some designs that are just a tad more detailed than simple line drawings while there are also many which involve extremely small and intricate elements. These will probably take sharp pointed pencils or ultra-fine nibs to color. I am pleased that, as with the second and third books, there are less designs with heavy black space. I consider this change from the first book to be a huge improvement and am happy with my design options apart from printing issues (see below.) Once again, they have included glossy pages at the end of the book. I will use them as I did the first time around, as a reminder of the actual colors of the characters and scenes. I don’t necessarily use those colors but it is nice to have a reminder handy. Water-based markers leave slight shadows of color on back of page though Tombow brush end markers did the best with most colors not leaving any shadows if applied lightly. Coloring Pencils work well with this paper. It is rough enough to provide good tooth to hold the pigment. I got good results with both oil and wax based pencils for coloring, blending, and layering. The book is printed on both sides of off-white (almost cream) heavyweight and non-perforated paper. Only a few of the designs are printed across two pages and merge into the binding (which is glued rather than sewn.) I did a count and this is what I came up with: 68 one page designs, 7 of which are wallpaper repeating patterns; 5 designs spread across two pages but only one of them had elements of importance in the binding area while 2 of them were wallpaper style patterns. In my copy, the images on the two page designs are mixed as far as lining up. Three of the designs do fairly well and two do not. My first book in this series had a very weird kind of musty odor. I’m happy to say that the final three books in this series, including this one, did not have the offensive odor I encountered in the first book. I hope this is true for everyone who buys this coloring book. I will use coloring pencils and India ink pens primarily for this book. If I use other mediums, I will do so knowing that it will ruin the design on the back of the page. I do this when I don’t really care that much for the backside of the page design. While using markers, I recommend the use of a blotter page (heavy weight paper or several sheets or regular paper) under the working page to keep the ink from seeping further. I’ll include a silent flip-through video as well as a few sample photos so you can see if this set of postcards will work for you. Once again, Scholastic has released a set of postcards based on a Harry Potter coloring book. 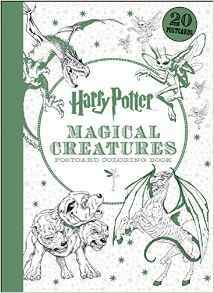 In this case, the subject is Magical Creatures which was the second coloring book in the series. Postcards are inherently a little more difficult to work on as everything is scaled so much smaller than in a book. I’ve found that if I use small nib gel pens, ultra-fine point markers, and very sharp and hard pencils, I have an easier time getting into all the small and intricate details. The mix of designs in the postcards are fairly good for my taste. I enjoy coloring the small details and should enjoy coloring these to give to all the Harry Potter fans in my family. I will probably mount these on folded cards and either frame them or give them as cards versus sending them through the mail as postcards. That is my personal preference but these should hold up well as postcards in use provided you use waterproof medium so that rain and moisture won’t cause havoc with your coloring. Alcohol and water-based markers, India ink and gel pens do not bleed through the card stock. Gel pens take a much longer time to dry than usual. The artwork is reminiscent of that of Marjorie Sarnat’s Creative Cats but with even more detail if you can imagine it. That there are 80 designs to color in this book makes it a real bargain. The only draw back is that the designs are printed on both sides of the page and that limits me as far as what I want to use to color the designs. The easy solution is to purchase another copy of the book and I am giving a lot of thought to that as the price is so good for the amount that is included. The designs are definitely intricate and many have small details. 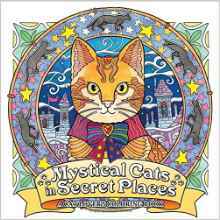 It might not be the best choice of coloring books for anyone who has vision or fine motor issues but if you can color in tiny spots, it is a beautiful book to add to your cat coloring book library. I’ve had cats as pets for many years but over the last year, the last of my very senior cats have passed away. For now, coloring cats will be my way of remembering my little friends. This book has so many different cats, its easy for me to see my little ones in their faces and attitudes. Water-based markers, except for Tombow brush end markers, can leave spots on the back of the page. The spots are small but you can see them on the other design. Gel pens and India ink pens do not bleed through the page. Colored pencils work well with the paper. Both oil and wax based pencils had good color and could layer and blend well with a pencil style blending stick. 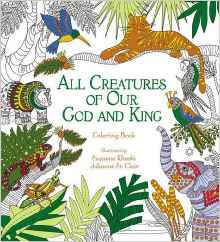 All Creatures of our God and King is the latest coloring book in Zondervan’s Coloring Faith series. It is the third such book that takes the lyrics of a famous hymn and provides illustrations to go along with it. The beautifully drawn illustrations celebrate the creatures of God’s creation but are not generally Christian in nature. The lyrics are most definitely faith-based and inspiring. I own both of the other books (Amazing Grace and It is Well with my Soul) and what I find different and perhaps better about this book is that the artists (Suzanne Khushi and Julianne St. Claire) have provided great illustrations on both sides. In the previous books, the lyric pages were only lightly illustrated. With this book, the left-hand lyric pages are just as beautiful for coloring as the illustration only pages on the right hand side. This hymn was inspired by St. Francis of Assisi in the Canticle of the Sun poem. An English pastor, William Draper, translated the words into English around the turn of of the twentieth century. He also set the words to music. The hymn was published in 1919 in the Public School Hymn Book. Colored pencils work really well with this paper. I was able to use both oil based and wax based pencils and get good color and to layer well. Using a pencil style blending stick, I was able to blend all of my colored pencils equally well. If you use alcohol-based markers, they will ruin the design on the back of the page. To minimize further damage, you should consider using a blotter page of heavyweight paper to keep ink from seeping further into the book. This is another great book in the Escape series by Good Wives and Warriors. It is the same size as the first two (at approximately 7.5 x 7.25 inches) and is loaded with designs which art both detailed and intricate. The designs are based primarily on William Shakespeare’s plays though there is a nod to one of his sonnets as well as his portrait, birthplace and the Globe Theatre. The designs are a wide range including dragons, sailing ships tossed on the waves, Ophelia in her watery grave, fairies, mermaids, witches cauldrons, maps of constellations and much more. The main focus are on the plays from Romeo and Juliet through Macbeth while the others have few designs, in some cases only one. The designs are appropriate for the time without modern anachronisms. Because of the size of the book, many of the design elements will take a well sharpened pencil or a small nib pen in order to stay within the lines. 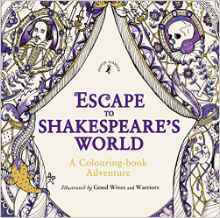 I studied Shakespeare quite extensively in school and I am very pleased to have this coloring book based on his works. I think it is a nice presentation. There are plays I might have liked to have seen represented but I believe that the ones included are those which most people most readily associate with the Bard. The attached cover of the book is well made and has gold foil, as well as black and purple. You can color the remainder of the cover (front and back) if you wish. The inside of the cover has fold-outs (front and back) and a white on purple line print which you can also color. The rest of the pages (including title and intro) are designs, so you can literally color this book on every page, if you choose to do so. The binding is sewn rather than glued, so removing pages will require a few snips of threads every few pages. I prefer to leave my together as it tells a whole story as it is but coloring into the binding takes some manipulation of the book. 96 pages of Imaginative Designs based on works by William Shakespeare and his world. Water-based markers left indistinct shadows on the back of the page but did not bleed through. Gel pens and India ink pens did not bleed through. Colored pencils work well with this paper both oil based and water based. I was able to layer and blend well and get a nice deep color with both types of pencils. Hard lead pencils did not dent through the paper. 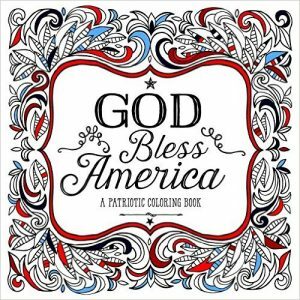 This is an interesting and well made patriotic coloring book. The designs are striking but are fairly easy to color without too much intricacy or small spots that require special pens. The artwork is by nine different artists (Holly Camp, Christina J. Culver, Deborah Gregg, Katherine Howe, Bridge Hurley, Joseph Marsh, Melinda B. Shiflet, Lisa Shirk and Jennifer Tucker) and the quotes are from 35 different sources (Thomas Jefferson and the Pledge of Allegiance are used twice.) At the end of this review, I will list the full source of the quotes, etc. that are used within the book. The book is definitely geared towards US patriotism, which is quite lovely at its release just before Independence Day (2016). While many of the quotes refer to God, not all do. A number of the quotes are simply about the country and/or about living together without discord. The quotes are diverse and, as I said, interesting. According to the book, the idea behind the book was to help individuals deal with their fears and concerns about troubles our nation faces today. While I can easily think of many Bible verses that deal with fears, the editors chose instead to quote Adlai Stevenson If America ever loses confidence in herself, she will retain the confidence of no one, and she will lose her chance to be free, because the fearful are never free. The book is well made with heavy duty paper. The designs are printed on one side of the page with historical information on the backside of the page. I really appreciate this as it allows you to remove a page (at the perforations) and still keep the design and information together in one spot. There are 37 different designs plus the title page, which is also used as the cover art of the book. Alcohol-based markers bleed through slightly on this paper. Water-based markers, gel pens, and India ink pens do not bleed through. Colored pencils, both oil and wax based, work very well with this paper. It is slightly rough with good tooth. I was able to apply thin layers to build to a really good and deep color. I was also able to blend colors easily using a pencil style blender. Benjamin Franklin, Francis Scott Key (The Star-Spangled Banner), Currency Motto, Thomas Jefferson (1), Douglas MacArthur, Pledge of Allegiance, George S. Patton, Cesar Chavez, Lady Bird Johnson, Samuel Francis Smith (My Country, ‘Tis of Thee), Proverbs 14:34, Paul Revere (via Midnight Ride by Henry Wadsworth Longfellow), Leviticus 25:10, Franklin D. Roosevelt, Martin Luther King, Jr., Katharine Lee Bates (America the Beautiful), Herbert Hoover, John F. Kennedy, Clara Barton, National Park Service, Eleanor Roosevelt, Susan B. Anthony, Julia Ward Howe (The Battle Hymn of the Republic), Frederick Douglas, Preamble to the US Constitution, Teddy Roosevelt, Harry S. Truman, Rosa Parks, Martha Washington, General Norman Schwarzkopf, Patrick Henry, Abraham Lincoln, Thomas Jefferson (2), Neil Armstrong, The Declaration of Independence, George Washington and Pledge of the Allegiance (2). 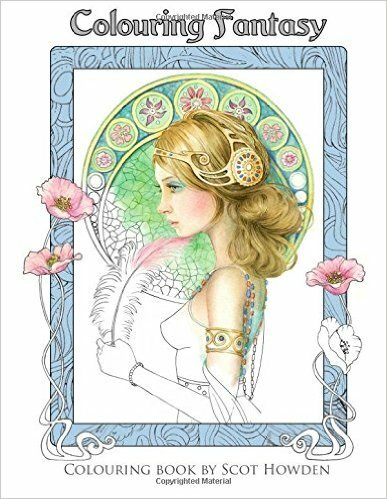 Colouring Fantasy is my first coloring book by Scot Howden. I purchased it without being able to see the pictures inside but I did my homework and found Mr. Howden’s artwork on-line. His Facebook page has beautiful renderings of the designs which were colored in the process of creating the book. I find his work, both original and in the coloring book, to be beautiful and ethereal. His line work is very light which keeps it from showing through too boldly and allowing the colors to speak for themselves. For the two designs I started with, I found myself heading towards lighter colors. I know that for other designs, I will go bold and bright. It just shows how varied and inspiring his work is. This is quickly becoming one of my favorite fantasy coloring books along with those by Jason Hamilton and Bennett Klein. The designs are a wide range of subject with some having more emphasis on fantasy than others. All of the designs of women have titles in the lower right hand corner. There are designs that have a Steampunk vibe, some of young women showing their artistic tattoos, a wildly doodled mummy, the cover art with a nod to Art Nouveau and Alphonse Mucha, dragons, a genie, fairies, a beautiful pirate, and more. There are 22 pages of full designs with two pages of enlarged elements to color. You can also color the title page which is a duplicate of another design in the book but on a different scale. 22 full page titled Fantasy designs plus two pages of enlarged untitled elements for a total of 24 designs. Alcohol-based markers bleed through the paper. Water-based markers spot through enough to mar pages below. Gel pens and India ink pens leave colorful shadows on the back of the page. India ink can leak through if you use multiple coats. Colored pencils work well with the paper. It has good tooth being slightly rough. I can use both oil and wax based pencils with it and get good results in coloring, layering and blending. Hard lead pencils dent through to the back of the page. I use and suggest the use of heavyweight paper or card stock as a blotter page under the page you are working on. It keeps seeping ink and dents from ruining the pages below. 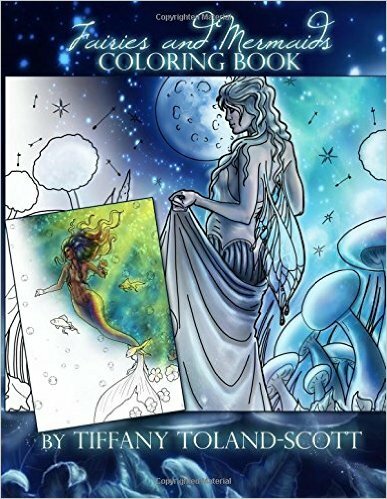 This is a book of fairy and mermaid designs by Tiffany Toland-Scott. It is my first by this artist. When I saw that it was available, I looked for her artwork online and was very impressed with what I found. In this book, she has converted her original artwork to line drawings. I found that her use of the female form was presented in a more natural look than many fantasy coloring books portrayed. It made it a different and unique experience to color. The book contains 28 designs but you are given two of each design, so there are 56 total designs to color. The designs are evenly divided between fairies and mermaids with 14 of each. In some cases, the artist has left the eyes blank so you can design them as you will. I generally keep a 0.38 black gel pen handy for these types of situations. I also find it handy for completing unfinished lines and/or adding details that I would like to see in my project. Paper is typical for books by CreateSpace. It is thin, white, slightly rough and non-perforated. For books by CreateSpace, I recommend using a blotter page under your work regardless of which medium you use. Ink and/or dents from pencils can easily mar the page(s) below. Alcohol and water-based markers bleed through this paper to some degree. Gel pens and India ink pens leave colorful shadows on the back of the page. Using more than one coat of India ink can result in the ink leaking through. Colored pencils work well with this paper. While it is thin, it has fairly good tooth for capturing pigment. Both oil and wax based provide good color, layer and blend well. Hard lead pencils dent/score through the page. This is a smaller format weekly calendar with artwork by Mary Engelbreit. I was hoping for iconic Engelbreit images and I was disappointed. The artwork in the book are mostly flowers with some other plants and a bird or two. The designs are very simplistic and are what I would expect more from a daily type calendar than one set up for a week. It took me about half an hour to color my first design and I did that while I was watching/listening to a television show. Otherwise, the calendar is made decently for its purpose. It has each week of the year as well as a full one page calendar for 2017 and a page which has the full year calendar for 2016 and 2018. It also has a couple of pages of planning note lines for 2018. The paper is a medium weight and the book is glue bound. It is printed on white paper is not perforated. The designs are printed on the left hand side of the page and the calendar on the right. I found that only alcohol-based markers bled through the paper. Water-based, India ink, and gel pens did not bleed through or leave shadows. I was able to get good color, layer, and blend with both oil and wax based pencils. The designs were too simplistic for my taste and were not what I expected from Mary Engelbreit. 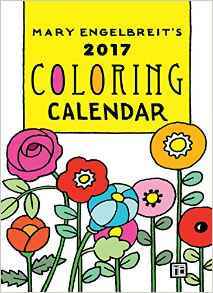 On the plus side, they are easy to color so this might be a good calendar to color for those who have vision or fine motor skill issues. I am keeping the book to use for its purpose. I keep a lot of information on-line but there are some things that I prefer to keep written down for privacy sake. I will use this book specifically for those and will color in it when I want a project that takes minutes rather than an hour to finish. 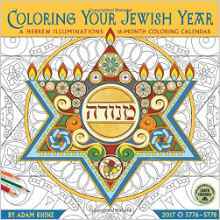 I was recently introduced to Adam Rhine’s artwork and coloring designs in his recently released coloring book Hebrew Illuminations Coloring Book. I was so taken with the designs, that I also purchased this calendar so that I could color some of his work in a larger format. As with his book, the designs are beautifully drawn. A calendar of 16 months is a Jewish tradition but as I am not Jewish, I was happily surprised to receive 16 instead of 12 designs in the calendar. In the Gregorian calendar (or Western calendar), the dates start with September 2016 and continue through December 2017. These months correlate with the Jewish year 5776-5778. The calendar contains holidays and much more information as well. The calendar is a standard 12 x 12 inch size. It has a hanging hole at the top of each page. What is really great about the way the calendar is constructed is that it has a spiral binding at the top. That is really unusual for coloring calendars. I usually have to have a large tabletop to hold the calendar open or I have to bend it back on the crease which weakens it over time. Paper is heavy weight, white, slightly smooth and non-perforated. Spiral binding at the top of the page with plenty of room to cut out a design if you wish to frame it. Alcohol-based markers bleed through this paper. Water-based markers are mixed. I had no problems with brush end Tombow or Staedler fineliners; however, my Stabilo 88 has some spotting through to the back of the page. Gel pens and India ink pens did not bleed through this paper. Colored pencils worked well. I was able to get good color with repeated applications at a light touch, blend and layer different colors with both wax and oil based pencils. Hard lead pencils did not dent through to the back of the page. My plan with this calendar, as with others I have colored in the past, is to color the month’s design at the beginning of the applicable month. That way, I can enjoy seeing the finished design and still be able to use the calendar for its intended purpose. If I use alcohol-based markers (and I will) it will seep through and mar the calendar. By doing it as I discuss above, I won’t mar a calendar page until after the month is over.